Disclaimer: the good folks at No Starch Press were kind enough to provide me with a review copy of this book, but this did not influence my assessment in any way. 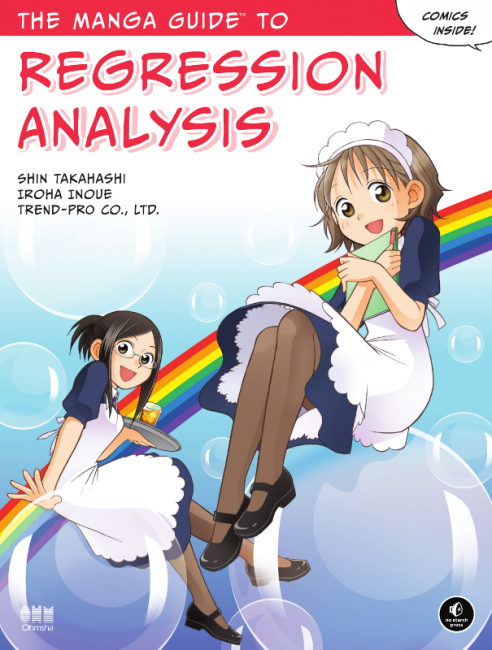 The Manga Guide To Regression Analysis (affiliate link) is No Starch’s latest addition to the popular Manga Guide series which so far consists of 12 books covering different topics in science and mathematics. Not surprisingly the series is originally from Japan, where it is published by Omsha. Having read quite a few books on mathematics and statistic, I know from personal experience how dense and boring they can be, so any effort to make these very interesting subjects more approachable is more than welcome. The story follows waitress Miu, who would like to study regression analysis to get closer to a handsome customer. This in itself may turn some people off this book. The whole idea that a female main character only wants to study some maths so she can get closer to her secret crush can seem a bit demeaning to women. STEM subjects already suffer from a shortage of females, so we should encourage them as much as possible without further stereotyping them. At least this is somewhat redeemed by the fact that Miu’s teacher is her female coworker Risa, but some readers may still be bothered by this. The book starts of with a pretty long section on mathematical concepts like logarithms and differential calculus. While nicely presented it didn’t seem necessary to do it in such a condensed form (or at this length considering that this is supposed to be an introductory text), I think it would be less scary for potential readers if the relevant bits got introduced as needed. From what I’ve gathered online that’s what other parts of the series do, and I believe it would also have worked better in this volume. As the story progresses we are introduced to the regression equation, with examples relevant to the café the main characters work at. From there the title moves on to introducing correlation coefficients, hypothesis tests, variance analysis, and confidence intervals and much more. Once again the presentation was nicely done, but I couldn’t help but wonder if somebody with a limited maths/statistics background would be able to follow. This becomes even more of an issue when the book moves on to topics like multiple and logistic regression analysis. If this is one’s first exposure to these concepts, I’m not sure that the content up to that point will have been sufficient for understanding, while readers already familiar with the subject matter may not find too much interesting material here. Overall this has not been my favorite title by No Starch so far, but I never read one of their Manga Guides before. While I do appreciate the attempt to make difficult subjects more approachable, I’m not entirely sure it worked for me in this case. Without previous knowledge of statistics and regression analysis I think some parts of the book would have been a bit over my head, though that is obviously a bit hard to judge. That said they drawings are nice with a cute enough background story (if you can deal with the caveat mentioned above) and different approaches work for different people. So while I can’t give this book a wholehearted recommendation, it’s definitely worth checking out if you need to learn some regression analysis and find more traditional books too boring. It could also be a useful resource during exam preparation or revision, since the nice and easygoing presentation could be beneficial to those with prior knowledge of the subject.